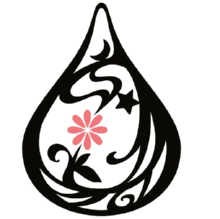 Today, namely Feb.11 is the “National Foundation Day”(/建国記念の日、Kenkoku　Kinen　no Hi) . This public holiday was set in 1966, but “Kigen-setsu”(/紀元節、the day of the foundation of the state of Japan) was set in 1872, an early year in the Meiji Era(1868-1912) and was abolished in 1948. This year 2010 is , in our old calendar of Japan, 2670. According to the Japanese myth and legends, Emperor Jinmu(/神武天皇), the first emperor of Japan was said to have been enthroned on the old Kigen-setsu day 2670 years ago in the first year of this country , having unified the nation. Yet after WW2, this premodern idea was denied and abolished. So, this current holiday of ours is not for the commemoration of the enthronement of the emperor, but for commemorating the beginning of the nation and nurturing the feeling affinity for the nation, and doesn’t necessary mean people admit that on this day 2669 years ago Japan started or the first emperor’s reign and government began as a historical fact. 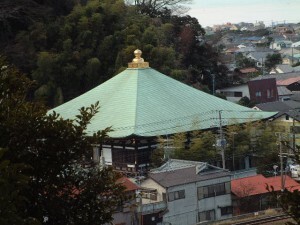 At a lot of Shinto shrines and some temples, comemorative events have traditionally been held as well as many secular meetings and events at municipal facilities and others. 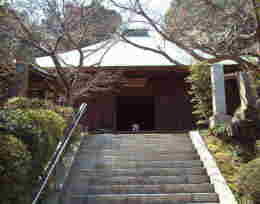 For instance, the ” Aragyou”(/荒行、ascetic practices) at Tyoushouji Temple(/長勝寺)　in Kamakura is very famous. 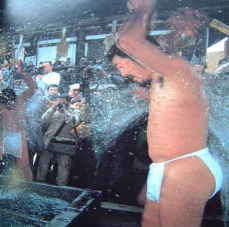 Today the Aragyou was practiced as every year at that temple. 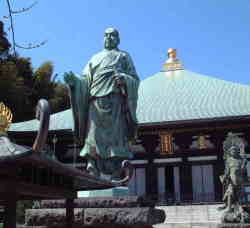 The Aragyou is that a lot of ascetic monks of the Nichiren-shu denomination of Buddhism having gone through ascetic life of eating only porridge and conducting crucible water ablutions for 100 days in advance, perform special sacred ablution practice with unbelievably cold water on the frigid winter day, praying for world peace and good luck of people. Today, as has happened in the past, the Aragyou was implemented by many ascetic participants , spectated by a lot of visitors including tourists, as this event is very famous and popular not only in Kamakura area but also all over Japan, which TV stations’ coverage was done. Needless to say, originally, the Japanese nation’s foundation had had nothing to do with Buddhism, as it was a religion introduced from foreign countries, yet as time went by, the “Japanese” Buddhism has become inseparable elements of our Japanese culture, plenty of such interesting events and practices as the Aragyou have been created, conducted, and made much of through the long history of Japan “who has just 2670 years old” today ( Buddhism is said to have been first introduced to our country in 538 AD). Though this day of the Feb.11 is not historically the beginning of Japan, having such a holiday to confirm and reminisce about the background and the nation’s identity is very important to cherish our historical and cultural assets.